Just in case anyone is wondering what happened to March – so am I. Isn’t it strange how sometimes you can sweep a whole month under the carpet without even realizing? In fact, did anyone even notice March? Maybe there wasn’t one. Maybe March decided to not so much march as walk – clean out of the door. Well, whatever month it was, all I know is that it is one that I would rather forget as two particulalry unpleasant things happened to me, none of which I feel like sharing with a wide-eyed web. Sorry about that! 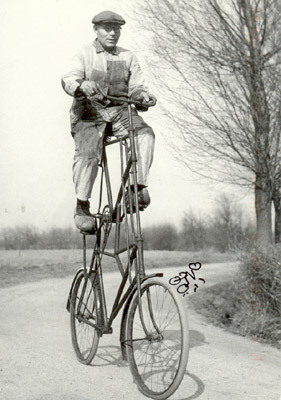 Anyway, as well as still rowing single-handedly across my bedroom floor, I’m back to two fully knee’d cycling again. Don’t know where I’d be without my cycling as it makes everything seem better even when it isn’t. As for book-writing, I’m still at it, thought what with everything else that has been happening, it has gone slightly out of the window. That’s the good news. The bad news is that I’m still on the boat to New Zealand. Amazingly I’ve made it across the Atlantic and through the Panama. I’m now bobbing about in the middle of the Pacific. If it’s all right with you I will probably be floating around here a while because the Pacific is blinking big. Come to think of it, is there anyone out there who is remotely interested in a book by me that doesn’t involve cycling – i.e. me and immobile bike stuck on a rustbucket Russian freighter with a sizable shipment of Russian seamen sailing (and breaking down – plus almost everything else that can go wrong) across the world’s two largest oceans to New Zealand. I promise my next book will be about me cycling (and breaking down – plus almost everything else that can go wrong) around New Zealand. Should anyone feel so moved, please either give this idea a thumbs up or a thumbs down in my website Guestbook department. If you give me the thumbs up I will pay you handsomely and love you forever. If you give me the thumbs down I will wedge you up my bottom bracket. There, how’s that for a threat? Must fly, I’ve got some long-distance cycle-rowing, not to mention long-winded writing, to be doing. Might just have another look for March under the carpet. There again, I haven’t yet looked in the bottom of the laundry basket. That’s usually where the most unexpected things turn up.